A big shout out this Children’s Mental Health Week to our friends at Time To Change – a social movement that aims to end mental health stigma and discrimination, so that we can all feel comfortable to seek help with our mental health if and when we need it. Today they celebrate their annual Time To Talk Day, encouraging people around the country to get involved in conversations about mental health and emotional wellbeing. This year, Time To Talk is all about getting together the right ingredients for a conversation about mental health – whether that’s tea and biscuits with a close friend, or a roomful of students colleagues having a chance to challenge mental health stigma together. Here at Tynecastle High School, we believe that talking with people we trust is one of the key ingredients in keeping ourselves Healthy: Inside and Out, especially when life gets more challenging. All students at Tynecastle High School (from S1 through to S6) can access Place2Talk, our self-referral service where young people can come to speak with a trained Counsellor about whatever is on their mind. Parents and carers too can find support in school from Place2Be, through Parent Partnership sessions and our Parent Counsellor. For more information, contact Place2Be’s School Project Manager, Sarah Haywood. Happy Half-Way Through Children’s Mental Health Week! As you know, this week the Tynecastle learning community is thinking about the simple steps we can take to keep ourselves Healthy: Inside and Out. If we are able to take part in them, exercise and physical activity can be an important part of supporting both our our physical and mental wellbeing. According to a report from the Mental Health Foundation, “even small increases in levels of activity can make a real positive difference, bringing about a cycle of positive reinforcement and motivation to continue”. Our bodies are unique and each person will know best what they can manage when it comes to physical activity – but the evidence is good that every tiny bit helps! What kinds of things do you like to do to keep your body and mind active and healthy? Whether it’s training for an event or just making sure you take a walk outside every day, there’s something to suit everyone. Tynecastle High School offers a range of opportunities at lunchtimes and after school — have a look at our Sports Clubs and Active Schools page for more information, or contact our Active Schools Coordinator, Ricky Karoyan. It’s Children’s Mental Health Week (4-10 February)! 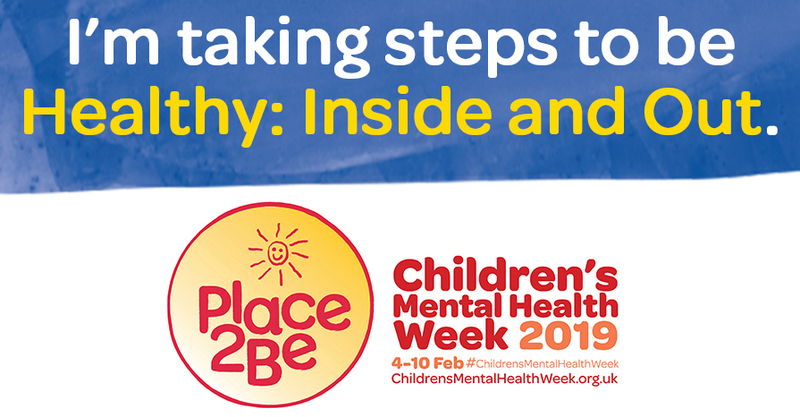 This week, Tynecastle High School are proud to support Children’s Mental Health Week – Place2Be’s annual campaign to shine a spotlight on the importance of children and young people’s mental health. This year’s theme is Healthy: Inside and Out and we’re encouraging everyone in the Tynecastle High School community to think about how they look after their bodies and minds. Physical and mental health are connected, so the simple things we do to look after our bodies can also help with how we feel. This week in school we’ll be thinking about things like food, physical activity and sleep, plus the impact of our digital lives on physical and mental wellbeing. What positive choices can we make to keep ourselves as well as we can be? If you’d like to get involved, we’d love your help in spreading the word. The Children’s Mental Health Week website has a range of resources, including tips for parents and carers. For more information, you can also contact our Place2Be School Project Manager, Sarah Haywood.